Today, I'm sharing my updated skincare routine that I've (miraculously) been sticking to for healthy, clear, glowing skin. One of my goals for our wedding day is to have my skin look the best it's ever looked (without caking on a ton of makeup). I've been sticking religiously to a regular skincare routine and I've found the perfect one for my dry to normal skin type. 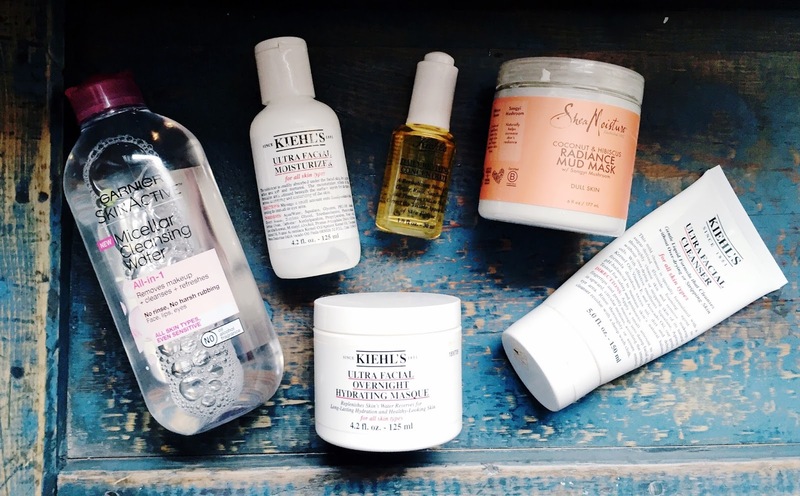 Clearly, I'm favoriting Kiehl's products. This cleanser is perfect for dry skin. It works into a nice lather and doesn't leave my skin feeling stripped of it's natural oils. This has been the only face wash I've ever repurchased. I love the clean scent of this facial wash as well! I've tried all the drugstore micellar cleansing waters out there, and this one is hands down the best. It doesn't sting my eyes when I try and take my makeup off (which I find happens with others) and my skin feels so smooth and clean after I use this. I like to use this after I've washed my face to cleanse anything I may have missed in the shower. The key to my glowing skin has been this serum. I put this on in the morning and at night after I wash my face and my face in instantly drenched in citrus-scented goodness. They say you only need one or two drops for you entire face, but because I'm so dry I use four to five drops. I top off my Kiehl's routine with their infamous Ultra Facial Moisturizer (supposedly loved by Kylie Jenner). This moisturizer contains glycerin making it the perfect base for your foundation. I like to wear this at night when my skin is feeling extra dry, especially in winter. While it does feel thick on my face, my skin is noticeable hydrated and plump the following morning. I like to use this twice or three times a week. I love treating myself to a clay face mask once a week, and this Shea Moisture mask from the drugstore is perfection. I leave it on for 20 minutes and rinse off with warm water. Instantly, I have soft radiant skin.